I should be honest and say I’ve never been to Brighton Beach during the summer. Weird, I know. It’s probably way more enjoyable when it’s above freezing. See, it wasn’t intentional, but somehow I had this knack to choose the coldest, most frigid day to trek out to Brighton Beach. Layered until my arms couldn’t bend, I’d take the B Train to the last stop and get off to meander down Brighton Beach Avenue. It is a world eons away from the tourist-packed streets of Manhattan or Coney Island. I loved Brighton Beach for its grocery stores, like Gourmanoff, and it’s fun shops that had cheaper house slippers than Chinatown. Here I made a dessert that mirrors the delicate flavors of Russian cakes. 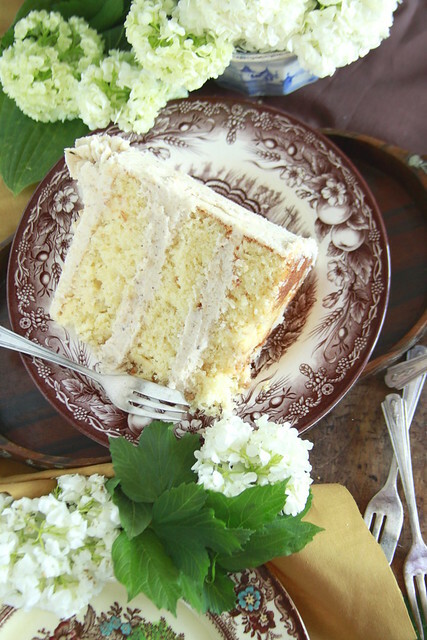 Using powdered sugar in the cake batter yields a melt-in-your-mouth crumb. Since I used only fresh hazelnuts, and no hazelnut extract, I didn’t add other flavors like fruit or chocolate. 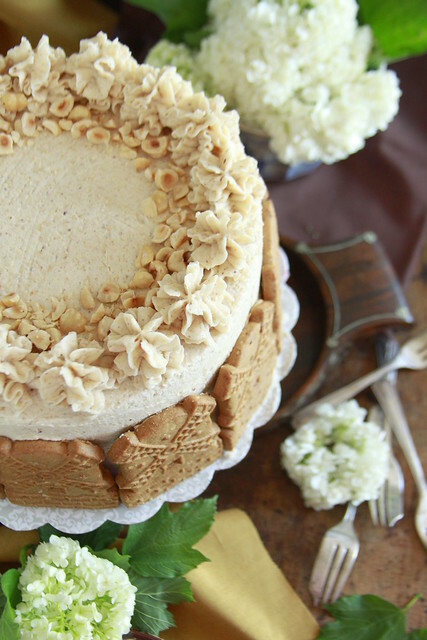 Basically, this Brighton Beach Hazelnut Cake is pure unadulterated hazelnut flavor. 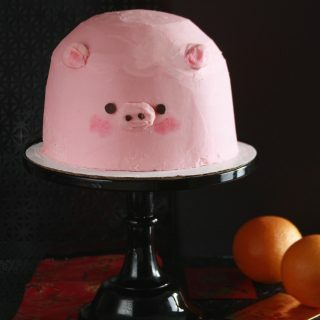 But one flavor, does not mean the cake is dull. 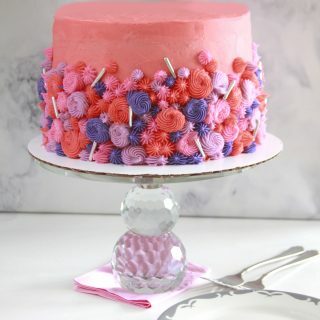 Instead, I added neutral elements to balance the cake out. 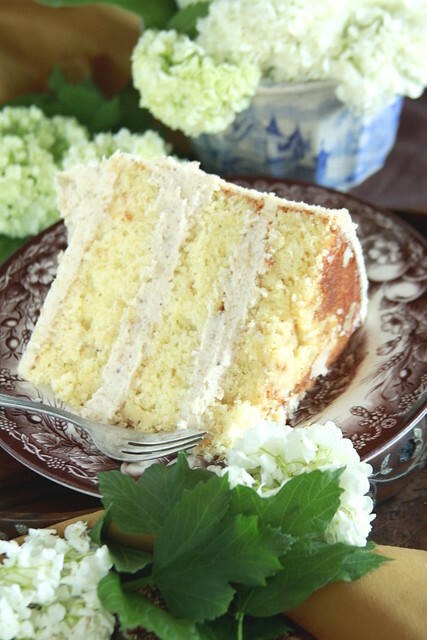 I crushed up vanilla cookies between each layer to give the pillow-soft cake some textural differentiation. Roughly chopped roasted hazelnuts and simple windmill cookies give, the otherwise monotone cake, varying contrast. After running around the area, I always finished my day in Brighton Beach at the beach itself. Even a minute of onlooking, despite the winter advisory arctic chill, was a wonderful site. The sand sparkled, not from the minerals, but from crushed glass bottles. Regardless of the temperature, there was always one man walking in a Speedo, hairy from neck to groin. The blurred outline of cruise liners departing for Florida filled the horizon of cold skies and even colder waters. It was a moment, a freezing moment, but Brighton Beach was, and is, always worth the trip! In a stand mixer fitted with a whisk attachment, whip egg whites and cream of tartar at a medium-high speed until medium peaks form, about 3 to 4 minutes, pour into a separate bowl and set aside. Sift flour, ground hazelnuts, baking powder, and salt in another bowl. Fit the stand mixer with a paddle attachment and beat butter at a medium speed until smooth, about 45 seconds. Add sugars and cream together for 1 minute. Beat in egg yolks one at a time, mixing until combined. Scrape bowl and paddle down. Beat in vanilla. With the mixer on low, add dry-mixture in three additions and milk in 2 additions, beginning and ending with the dry-mixture. Fold in whipped egg whites. Divide batter between prepared pans and bake for 28 to 33 minutes, rotating halfway. The edges should be slightly golden and a toothpick inserted should come out mostly clean with a few moist crumbs. To prevent over baking, invert cakes after 5 minutes onto a wire rack to cool completely. Combine ground hazelnuts, powdered sugar, and salt, pulsing 4 to 5 times to mix. With the processor on, stream in heavy cream until paste forms. The paste should have the consistency of coarse peanut butter. If too thin, add more powdered sugar, or if too thick, add a splash or two of heavy cream. 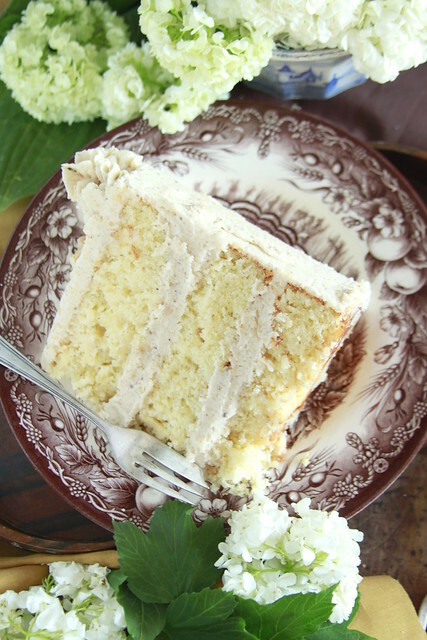 Refrigerate until you make buttercream. In a stand mixer fitted with a paddle attachment, beat butter and hazelnut paste until smooth and combined, about 1 minute at medium speed. Add vanilla followed by powdered sugar and salt. Scrape the sides and bottom of the bowl and paddle down. Beat until light and fluffy, about 45 to 60 seconds. Use a serrated knife to level off the cakes. Dollop a bit of frosting onto the cake board or plate. 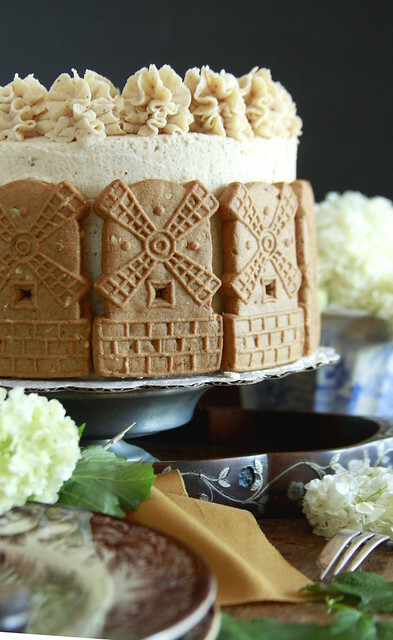 Place one cake layer onto the cake board and spread some of the Hazelnut Buttercream onto that cake layer. 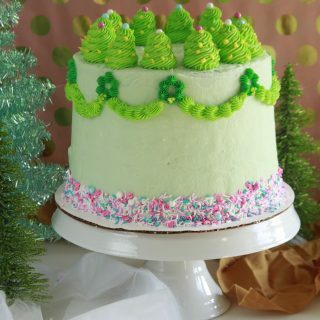 Press crushed cookies into cake layer, place the second cake layer on top, spread more buttercream, press more cookies into buttercream, and top with the final cake layer. Give cake a thin crumb coat and chill for 15 minutes. 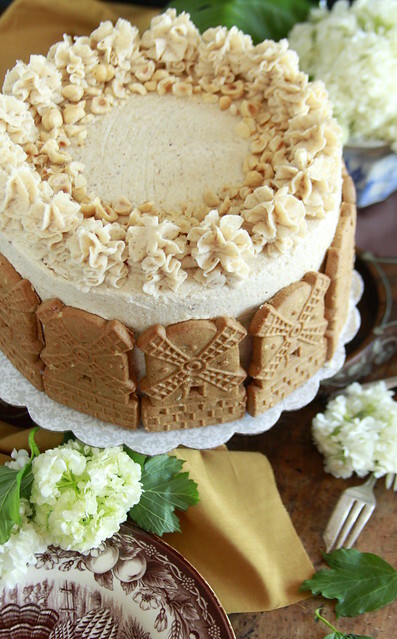 Coat cake with remaining buttercream, pipe a border on top and garnish with chopped hazelnuts. 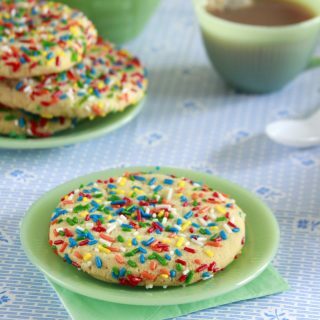 Press cookies into sides of cake.